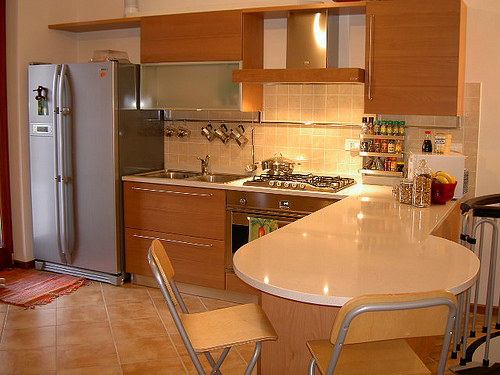 Whether you cook frequently or not, the kitchen is probably one of the busiest rooms in your home. Having an organized kitchen is not about buying a lot of organizing supplies; it is about taking a few guidelines and tailoring them to your specific needs. Here are 3 guidelines to use as you organize your kitchen. The items you use on a daily or weekly basis should be within easy reach. You shouldn’t have to tiptoe or do deep knee bends to find the items that you use every day. This guideline applies to your food, your dishes and your cleaning items. This is a deceptively simple idea that yields great dividends. Grouping items by use reduces the frustration of having to walk all over the kitchen to find them. If you drink tea every morning, for example, it makes sense to store the tea next to the sweetener, and the tea-pot relatively close to your tea cups. You do not need to fill every single nook and cranny in your kitchen. In fact, having some clear space rests your eyes. Your goal should be to leave at least 25% of any space free. How do you use to organize your kitchen? 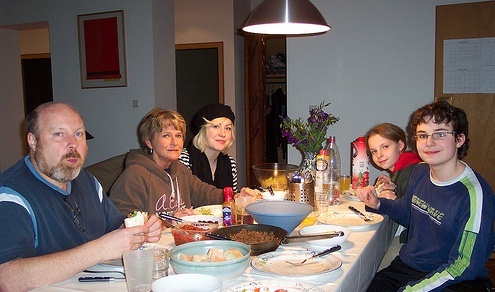 The topic of last week’s blog post was Family Meals Are Worth The Effort. 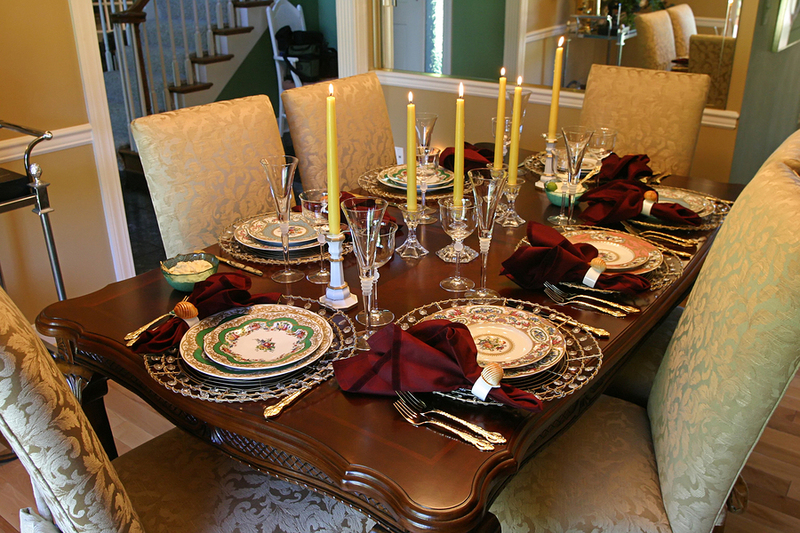 Not sure how to schedule family meals in an already jam packed schedule? These 7 ideas will help. If you find yourself running out of time to cook, try cooking 3-4 meals on the weekends. Freeze the meals so that when it’s dinner time, you simply have to reheat. As you prepare meals, think of dishes that can be repurposed – ex., the leftovers from tonight’s roasted chicken can become tomorrow night’s chicken quesadillas. 3 – Make friends with your freezer. In addition to freezing prepared meals, season and freeze ingredients so that they can be popped into the pot or oven when it’s time to cook. 4 – Make friends with your crock pot. The frozen ingredients mentioned in the previous tip can be popped into the crock pot to simmer all day. Voilà! At the end of a long day, everyone is greeted by the smells of a home-cooked meal. 5 – Have theme days. Eliminate the hassle of wondering what to cook by having theme days (ex., Meatless Monday, Taco Tuesday, etc.). 6 – Cheat (a little). Having a freshly prepared meal every day is impossible for some families. Every once in a while, it is okay to buy prepared foods (ex., get a rotisserie chicken from the deli and supplement it with a fresh salad). The Internet is home to a cornucopia of recipe sites. You can search for recipes for specific ingredients, limit your searches to recipes with 5 or fewer ingredients, choose recipes based on the amount of prep and cook time, and so much more. Wouldn’t you have more time for family meals if someone else handled the cleaning? If you need an Atlanta maid service to keep your home clean so that you spend more time with your family, give us a call at (404) 633-9652. I always love to come home after they’ve been here cleaning. They use natural products that smell good and get the job done. Read more reviews. How many times does your family eat together each week? Long work hours, long commutes, children with calendars that would make a socialite envious. All of these factors and more make it almost impossible to schedule regular family meals. If you are lucky to get everyone together to eat one meal a week, you are not alone. Regular family meals are well worth the effort, however. Regular family meals make financial sense.Fast food meals for a family of four can easily total $30. That same $30 can be used to prepare at least 2 satisfying, healthy, home-made dinners. All of the benefits still do not change the fact that most people think family meals take huge investments of time. This does not have to be the case. Stay tuned for next week’s article, which will offer 7 ways to make family meals consistent – and easy! Wouldn’t it be much easier to have family meals if you could start with a clean home? If you need an Atlanta maid service to keep your home clean so that you spend more time with your family, give us a call. 20 years and still happy! I started with S&S when I realized I couldn’t keep up with my housework, a child, and full-time job. The team came weekly for years and now after the kids have gone, they come every other week. It’s been a great relationship and I trust them completely.